The use of the Babel transpiler tool, to support ES2016 throughout. Testing support at the Unit, Integration and Acceptance levels as standard, powered by Testem and QTest. Support for live reloading, for shorter development cycle times. Templating using the Handlebars markup syntax. URL Routing first development to ensure that deep linking is fully supported throughout. Full data layer built around JSON API, but pluggable for whatever API access you need. In order to work with Ember.js, it is assumed that you have an up-to-date installation of Node.js and npm. If not then these can be downloaded and installed from the Node.js website. It should also be mentioned that Ember is purely a frontend framework. It has a number of ways of interacting with the backend of your choice, but this backend is not in any way handled by Ember itself. A lot of the power of Ember.js comes from its command line interface (CLI). This tool – known as ember-cli – powers much of the development lifecycle of an Ember.js application, starting from creating the application, through adding functionality into it all the way to running the test suites and starting the actual project in development mode. Almost everything that you do whilst developing an Ember.js application will involve this tool at some level, so it is important to understand how best to use it. We will be making use of it throughout this article. Once ember-cli is installed, you are ready to start creating your application. 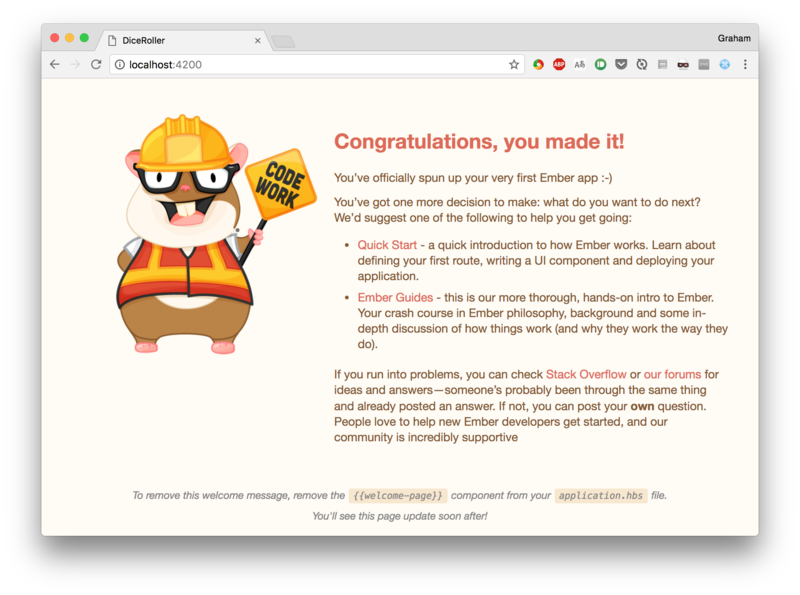 This is the first place we will be making use of the Ember.js CLI tool – it creates the entire application structure, setting everything up ready to run. This has caused an entire application to be created which is ready to run. It has even set up Git as source control to track your work. Note: If you wish, you can disable the Git integration and you can prefer Yarn over npm. The help for the tool describes this and much more. It is also running a LiveReload service which automatically watches for changes to the filesystem. This means that you can have an incredibly fast turnaround time when tweaking your site design. The initial page already tells us what to do, so let’s go and change the main page and see what happens. We’re going to change the app/templates/application.hbs file to look like the following. This is my new application. Note: The tag is part of how Routing works in Ember. We will cover that later on. This tells us that it has spotted that we changed the template and rebuilt and restarted everything. We’ve had zero involvement in that part of it. Now let’s look at the browser. If you’ve got LiveReload installed and running you will not even have needed to refresh the browser for this to be picked up, otherwise, you will need to reload the current page. Not very exciting, but this is with almost no effort on our part that we’ve achieved this. Built project successfully. Stored in “/Users/coxg/source/me/writing/repos/dice-roller/tmp/class-tests_dist-PUnMT5zL.tmp". Note that the output talks about PhantomJS. This is because there is full support for Integration tests that run in a browser, and by default, these run headless in the PhantomJS browser. There is full support for running them in other browsers if you wish, and when setting up continuous integration (CI) it is worth doing this to ensure that your application works correctly in all supported browsers. Before we get to actually writing our application, let’s explore how it is structured on the filesystem. The ember new command above will have created a whole directory structure on your computer, with lots of different parts. Understanding all of these is important to efficiently work with the tool and create amazing projects.